My name is Jeff Albertazzi and if you would have told my young self that I was going on my 18th year of teaching I would have laughed. School was always a “have to” for me growing up. I got good enough grades to stay on sports teams and Lacrosse is what eventually got me into college. It was there that I become a learner and not a student. Sure, I had to take classes to fulfill obligations but I saw Environmental Science as a way to make a difference and impact in the world. And I got to be outside. The learning process for me transformed because I was engaged and had purpose and our professor let me pursue that passion. That’s what I want to bring to my middle school students. I stumbled upon the teaching profession by accident. When I graduated college my sister, a current NVUSD teacher, mentioned they needed someone to go teach science on Mondays to fourth and fifth graders at Napa Junction. I quickly fell in love with teaching science to kids and proceeded to get my teaching credential. Soon I found my home teaching Middle school science and math and haven’t looked back since. Now as a father, I feel obligated to better the world for my daughter and teaching provides this opportunity. Recently, I have had the mind shift from teaching kids science to make a difference in the world to teaching them how to be critical thinkers and problem solvers through scientific thinking so the can have a positive effect on society. For this I am grateful for The Innovative Learning Masters program and Napa Learns giving me the opportunity to continue my education and mastering the craft of teaching, so the next generation of learners will be critical thinking, problem solvers. My journey began when I realized the future of education needed to keep up with the ever changing world. This meant how we teach and how kids learn. Technology is going to play a huge role in the future of education. The students live in and communicate in a digital world. It would not be fair to the students not to use technology or use it in limited ways. My effectiveness as a teacher would be limited if I wasn’t committed to learning and implementing technology through models like the TPACK. Getting to know the TPACK model has made me realize that there is no substitute for great teaching, getting to know your students or content knowledge. 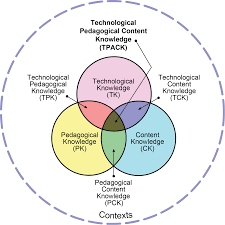 Technology is the piece in the TPACK model that is ever changing. I was using technology in the classroom pretty much every day but this program has shown me how to use it to foster creativity and getting to the "sweet spot on the TPAC". Prior to this program I was using it more as a tool and management system. Now I am blogging and vlogging with the kids not only about what they learned but giving feedback to each other during the learning process. Students are more clear on what the need to learn and how to get help to learn. Taking and trying these new tools with the students has been a good way to model growth mindset and the learning process. We have even created a youtube channel with a tech tips station that the student's screencast tips as we come across new technology. Investigating the videos about the brain, technology to foster 21st-century learning, reading the Flat World and the other studies have given me a deeper understanding of why it isn't a choice to shift education but an immediate need to do so.